When I arrive home from work, a freshly fed and bathed Henry runs to the door to greet me. He’s always entertained by the sound of his voice modulated by his flat bare feet banging the floor, so he runs with his mouth open, yelling “ahhhhhhhhhhhhhh.” He’s got on a white pajama shirt with a blue zebra, a red and yellow lion, and a green elephant embroidered near the top, just close enough under his chin that he can only see them if he pulls his shirt out and shoves his chin down. There are striped pants in colors to match. He usually me Ma rather than Mama, but he does it twice in a row. It makes him sound Asian sometimes, and Italian American at others. I take off my coat, and he knows my shoes are next to come off. So he looks down at them, then stops abruptly, marveling. Marveling, Henry-style, is indicated by freezing position, opening his mouth into an “o,” and making eye contact with whoever he wants to share the incredible situation with. When he knows he has your attention he looks at the marvelous thing again, and points, and repeats. His mouth stays in the “o” shape. Last night, he did that when he saw my shoes. At this stage he is very detail oriented, and he realized I was wearing different shoes than the ones I left in. In fact, these shoes I came home in had been sitting in my desk at work for about a month. He is intimately familiar with all of our shoes, because in the morning he chooese a pair for each household member to wear, and then distributes them. (In the summer, he passes out our bike helmets.) He does this so that we might all leave the house together in order to HAVE FUN. Of course, the reality is that he may leave with one parent or the other, but it’s unlikely that we’ll all go to the playground together on a Monday morning. However, this doesn’t keep his eager little heart from bursting with hope. Henry is a very efficient communicator. While the little girls I know of his age say astoundingly complicated things like “I would like to listen to my Michael Jackson record now, Mommy,” that’s not Henry, and I think it’s in part a gender thing, and in part a personality thing. (My dad says I was the same way.) He understands quite a bit—I’m referring to Henry, though my dad also understands quite a bit—but is very happy to get by with nodding or shaking his head when possible. Before yesterday I had never heard him say either of those words, shoes, or off before. He actually doesn’t usually pair together two words at a time, though it has happened. I was delighted, both because he’d said both words, and because he’s said them together. Aside from “what’s that,” I’ve only heard “go outside,” “more cookie,” or “hot chocolate.” I ask him, “Did you say ‘shoes off’?” He smiles and nods. He looks proud. His babysitter is putting on her own shoes and coat. He points to her saying “Sssssssssssssss” because her name is Celia, so he has adopted that as a moniker for her. He hugs and kisses Sssssss goodbye and yells “DOH!” as she goes out the door. Does this make you tired? If so, you know what it is like to be married to me. If you see our tree, you will note that most of the ornaments are in one clump, low down and towards the west side of the tree. I think it looks great that way. And then we get into a tiny skirmish because life is so overwhelmingly exciting, what with the tree and all, and with the more balls, that he would like to smash some stuff. You know, just to expend some of the exciting energy. More specifically, he would like to smash me, a little bit. He’d grabbed a sharp little packet of spare bulbs for the lights on the tree, full of glass and staples. I tried to take it away, and he clutched it tighter. I gave him a choice between giving it to me or having it taken away by me, and he collapsed onto his back and kicked me hard with both legs. Making full eye contact, which made it seem extra aggressive. So then we flirt with the idea of a Time Out, he and I, which would make his second punishment ever. I mention it and he becomes immediately hysterical. He is running away from me in circles moaning “Woof, Woof,” which is the given name of his dog blanket, who is his main ally other than me or his Daddy or Pistachio, who is the other special blanket. These blankets provides great comfort in times of sadness, like this. Then, with me acting stern, he starts to hyperventilate. I grab Woof for him and pick him up to comfort him and we sit down in the rocking chair in his room. He hugs me and then he grabs my face with both hands and pulls it to his and gives me a huge open-mouthed wet kiss that lasts for at least two beats. We hug. We rock. When he’s calmer I explain that when I want to take something away it’s usually because it’s dangerous. I’m thinking that this probably sounds to him like Arabic sounds to me, but he nods. I explain that kicking is not allowed. He nods again and puts his head on my chest and sighs. And then I get him ready for bed, which includes reading three books. One of the books is called ZOO and it’s by Bruno Munari. From a page of birds, he can pick out the owls from the “baby chickens,” which is what I called the pile of tiny yellow ones. The rest of the birds, I have no idea what kind they are. I really can’t expect any more of a person who is still busy being one. 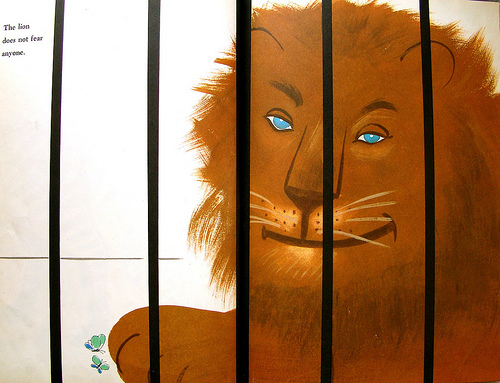 And then we get to the page with the smiling blue-eyed lion. Mostly he points at all big cats and says “KEY!” meaning, of course, Kitty. But today we get the the lion and he says, “Ma. Ma.” And points to the lion, and then pats me on the chest. And I think I have misunderstood him, because I have always associated pictures of lions with looking like me—I have a sort of an unstoppable lioness thing happening with my hair—and it seems too good to be true that he would call the lion Ma. But he does it several times, and when Matthew came home later he confirmed that he always talks about me when he sees that lion. I, too, am in a sleeping cage! And then Henry goes over and tries to climb up into his crib. This is scary. We all know why. First of all, I don’t want my child to fall. Actually, I retrofitted that reason to be first. Because secondly, let’s face it: climbing into a crib is surely harder than . . . I can’t even talk about what this might mean. The crib is a sleeping cage. I admit it. I like that we have a sleeping cage. It keeps us safe from him at 2am. Well, safer. Then he asks me to put four books in the bed with him. The only light in the bedroom is a bunch of stars and moons and planets projected on his walls and ceilings and floor, but he still wants a pile of books in there with him. I put in the three we’ve already read, plus the most prized possession in our house aside from Daddy and the Christmas tree and our kitty and Woof, which is a huge Richard Scarey book with pictures of everything on earth, but in an alternate reality people entirely by animals. “Da dat? Da dat?” That’s an owl driving a milk truck. That’s a mommy bunny cooking eggs in a yellow kitchen. That’s a daddy bunny slicing oranges with a knife. That a dentist who is also a walrus, or vice versa. And on and on for not just hours, but days on end. Weeks, if you’d like to get technical. I rub his back and whisper-sing three times while rubbing his back. But he’s still kicking one leg like a person who is far more restless than on the verge of sleep. I suggest that he relax and think about Sesame. I urge him to think about Bert trying to take a bath and Ernie pushing a piano into the bathroom so they can sing together, which is the premise of his new favorite record. And my new favorite record. Ah, the palliative powers of Sesame. He smiles and snugs his blanket up around him and hugs Woof tighter and is finally able to settle, still awake but thinking of something that makes him very engaged and happy. I think I say this at all of the ages, but I really like this one, where Henry can understand me so clearly, even if he doesn’t talk too much himself. I love that he is a sponge who wants to know everything about everything, and I love that he wants to share his passions with other people in such a visible way. ← Give the Gift of Chomp. “Does this make you tired? If so, you know what it is like to be married to me.” Meredith you always make me smile or tear up, but this made me laugh out loud. All the rest helped me remember the two sponges we raised and how those same sponges are raising others. How happy it makes me that all of you are such great parents and love your children so. And I wouldn’t know about it intimately without your blog and Facebook. How lucky we are! Aye, Henry really has your role figured out Ma-Lioness-Protectress with the beautiful blue eyes and gloriously bountiful coiffures! I basically love everything about this post. And I’m feeling bad I didn’t write everything down (both times) about my kiddos during the stage you’re describing, but your details remind me of the little moments like these that stay with me. Nice. I love your blog and am always excited to discover a new blog post through facebook. (You’ve brightened many of my commutes.) Am finally commenting because I’m reading this at home -and couldn’t stop laughing out loud. Thank you for sharing, you are a great lioness/wolf (and the lion’s eyes look exactly like yours!) Thank you! More than a nod or shake of my head! You are wise to capture these precious moments and memorialize them into words to be read by Henry in the future when he comes to you to inquire, “what was I like when I was a baby?”, as you have asked of us on so many occasions. Please keep writing for him, for us and for all your friends.